We have a full line up of events coming your way this fall, and although we say goodbye to another summer season, autumn is an exciting time of year at SkeenaWild. Here’s what we have in store for you! This is the last month to submit to the 2018 SkeenaWild Film and Photo Festival and we want to see what adventures you’ve been up to this year. Look below for details on how to enter the Skeena’s premier film festival event, and a chance to win some great prizes! Come on out to the Salmon Jam social & fundraiser next week at the Sherwood Brewery in Terrace, with a great lineup of local talents and delicious beer! Details below. 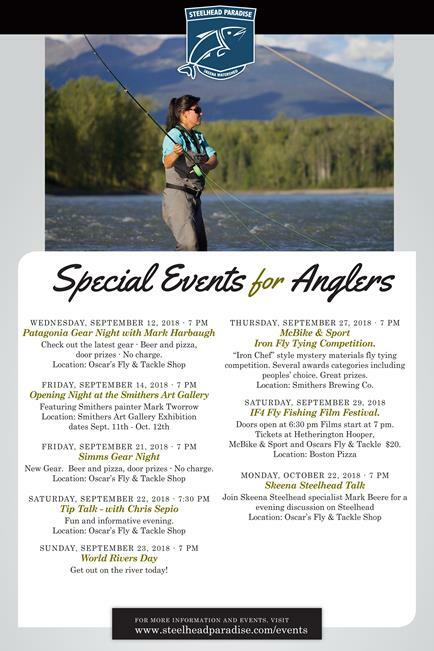 If you’re in the Smithers area, you wont want to miss this season`s cast of Salmon Paradise events! Patagonia gear night at Oscars’ Source for Adventure, World Rivers Day, and the Iron Fly-Tying Competition. Check below for the full listing of events. 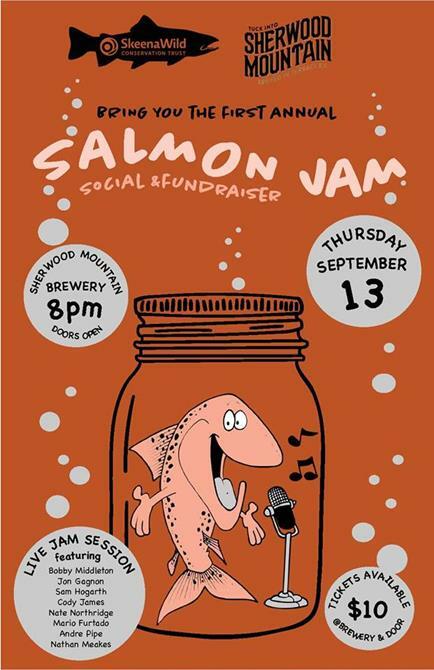 Join us for the Salmon Jam at the Sherwood Mountain Brewhouse! Drink some brews, share your views, sing some blues. This casual fundraiser and social event will be stacked with a seriously talented crew of local musicians who will be jammin' for the salmon. Thursday September 13th at 8pm the evening kicks off with live music from local talents including Bobby Middleton, Sam Hogarth, Cody James, Nate Northridge, Mario Furtado, Andre Pipe, and Nathan Meakes. We will have an open forum Q&A with SkeenaWild’s Executive Director Greg Knox to discuss environmental issues that concern our community. There will be a silent auction featuring local photography from past SkeenaWild Photo Contest participants. Tickets are $10 and available at Sherwood Mountain Brewhouse or at the door. For more information, checkout the event page of Facebook. 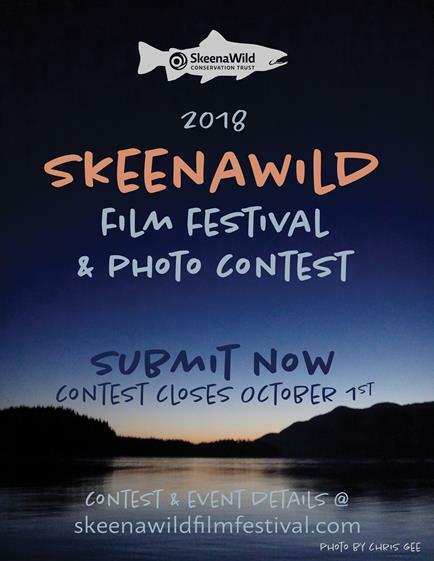 Last Chance to enter the SkeenaWild Film Fest! 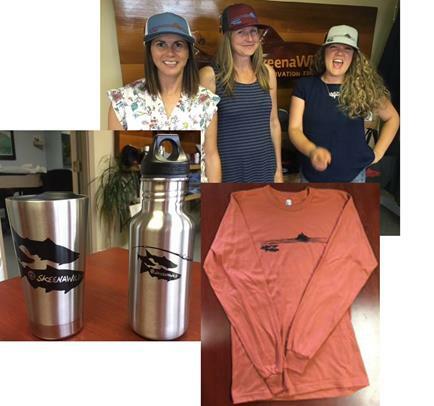 Submissions are still open until October 1st for the 2018 SWFF and we want to hear about your wild adventures in the Skeena Watershed. Enter today for your chance to win some great prizes and have your video or photos featured on tour across the northwest and beyond! To enter go to skeenawildfilfestival.com, fill in the short entry form and submit today! P.S. Take a look at last years entries for some inspiration. Another Season in Salmon Paradise. 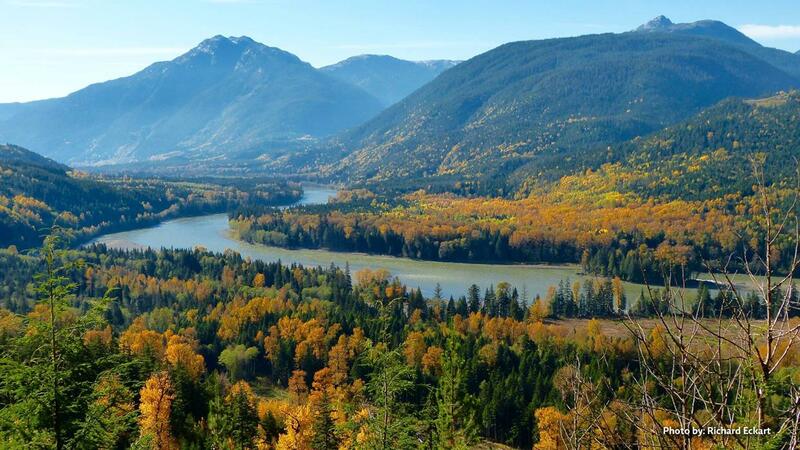 There are events taking place all month in Smithers to celebrate this amazing environment and enjoy a truly iconic northwest creature: The Steelhead! Sept. 27th @ 7pm – McBike & Sport Iron Fly Tying Competition at Smithers Brewing Co.
Or go to steelheadparadise.com to find out more. Should Vopak Pacific Canada Oil on Rail Proposal Be Exempt From an EA? Have Your Say! Vopak Pacific Canada is proposing to ship diesel and other fuels through the northwest rail corridor for export in Prince Rupert. They are lobbying the government to avoid undertaking an Environmental Assessment. This project would bring serious risks to public safety and the environment. Until October 9th local communities have an opportunity to provide input whether they think this is a good idea or not? You can provide comments to BC government through this link at the BC Environmental Assessment Office by clicking this link. Lake Drive Lumber takes old trees that would otherwise be burnt or disposed of and turns them into amazing works of art and furniture. Utilizing local timbers and creating value added products, Lake Drive Lumber is a model for local economic development. Watch the video below or follow this link to see what Bruce, Leanne and the crew is up to!